Often when people think of “orthodontics” they immediately think of the teenager with a mouth full of metal. But today, it’s a new world for patients needing to address misaligned teeth and other bite problems. While it’s true that braces are still metal, they are smaller today and more comfortable to wear. But what about the patient who doesn’t want wires or metal at all? Our orthodontists are able to offer a clear alternative: Invisalign®! 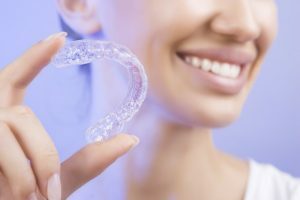 At Orthodontics by Birth & Fletcher we are proud to provide our patients in Arlington, Keller, Burleson and Fort Worth Invisalign® clear plastic aligners. We are proud to have the distinction of being a 2019 Invisalign Diamond+ Provider! Watch the video below for how Invisalign® can help you get the smile you’ve always wanted. As we’ve mentioned above, one of the biggest advantages of the Invisalign® system is the ability to remove the trays for easier teeth cleaning. For our patient, taking care of their teeth is the same as if they had nothing on their teeth! It’s important to not neglect maintaining proper oral hygiene to prevent food from being trapped in the aligners. For this reason, we ask our patients to brush their teeth after every meal or snack to prevent food from being trapped in the aligners. You should also clean your aligners regularly by brushing them and then rinsing them with water and liquid hand soap (Dial). In the Metroplex, we feel there is no better choice for you than Orthodontics by Birth & Fletcher. Not just because we say so, rather because so many of our patients feel that way and because we are a 2019 Diamond+ Invisalign® Provider. Please call us today for a free consultation to see if this treatment is best for you!